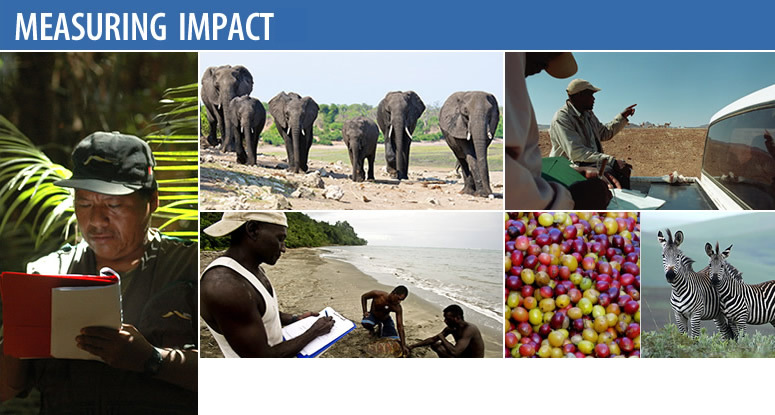 Measuring Impact was a six-year contract (2012-2018) that aimed to increase USAID’s capacity to design, monitor, evaluate, and improve the impact of global biodiversity conservation and natural resource management programs. Partners Environmental Incentives, Foundations of Success and ICF International worked with the USAID Bureau for Economic Growth, Education, and the Environment/Office of Forestry and Biodiversity (E3/FAB) to develop effective performance measures, enhance cross-project learning, foster communication, and build capacity for adaptive management. Measuring Impact 2 will build on MI's success. Biodiversity conservation and natural resources management are integral to advancing human prosperity and enabling resilience in the world’s most vulnerable populations. USAID policy, including the Biodiversity Policy, calls for more strategic, evidence-based and effective programs. Measuring Impact helped USAID operating units meet this call by providing technical assistance with rigorous and well-informed situation analyses, clearly defined theories of change, and results-based performance indicators. Consistent with USAID Forward reforms and the Agency’s Collaborating, Learning, and Adapting approach, these strategies allowed the Agency to improve outcomes through learning and to articulate how conservation supports good development outcomes across sectors. This is a summary of the How-To-Guide describing how to define outcomes and indicators. This is a summary of the How-To-Guide describing what a results chain is and how to build one. This is a summary of the How-To-Guide describing what a situation model is and how to build one.